Mgahinga Gorilla National park is a well known park for gorilla safaris. At just 33.7km2, Mgahinga Gorilla is Uganda’s smallest national park. However, it is also one of the most dramatic for the park lies on the northern slopes of Mts. Muhabura, Mgahinga and Sabyinyo, three volcanoes that create an unforgettable regional backdrop. These peaks are three of the six Virunga volcanoes that mark the southern limit of the Albertine Rift Valley and are divided between Uganda, Rwanda and DR Congo. The Virungas are home to more than half of the world’s population of the endangered mountain gorilla. 380 individuals roam the slopes of the volcanoes while the remaining 340 live nearby in Uganda’s Bwindi Impenetrable National Park. Fortunately for the gorillas, Mgahinga’s small area is supplemented by those of two larger, adjoining parks in Rwanda (Volcanoes NP) and DR Congo (Virunga NP). Though gorilla tracking is the park’s most popular activity, Mgahinga merits a visit simply to appreciate the scenery. A choice of hikes allows for all abilities, ranging from the 8 hour return trip to the summit of Mt. Muhabura, to gentle strolls across the lower slopes beneath the magnificent three peak backdrop. The park experiences two rainy seasons; March-May and September-November. October is the wettest month, with 250mm of rain and July the driest with just 10mm. Mgahinga’s slopes are covered with a series of distinct altitudinal bands of vegetation. The lowest zone is an area of grass and bush which was formerly encroached and cleared by farmers and is now regenerating. Undisturbed vegetation starts with montane woodland, followed by the bamboo zone, montane forest and the Ericaceous zone which contains giant tree heathers. The sequence culminates with the spectacular alpine zone which occurs only on East African Mountains above 3000m and includes bizarre giant forms of lobelia and groundsel. The park contains at least 39 species of mammal and 79 birds. Larger mammals include elephant, leopard, buffalo and bush pig but these are rarely seen. Mgahinga’s most famous resident is the mountain gorilla. 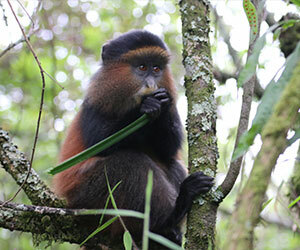 Less famous but equally rare and deserving of protection is the golden monkey which is found only in the Virungas and in one other forest in Rwanda. Notable bird species include the Rwenzori turaco, crowned hornbill, black kite and crowned crane. The Mgahinga has three volcanic peaks, Muhubura (4127m), Sabyinyo (3669m) and Mgahinga (3474m). These can all be climbed. Though no specialist equipment is required, a reasonable level of fitness is necessary if you intend to enjoy the experience. The Batwa Trail leads from the base of Muhuvura Cave. This walk is conducted by Batwa guides VI insights into their traditional forest life and culture. The 342m long Garama Cave lies beneath a plate northern edge of the park, 3 km from Ntebeko. It is former farmland zone but in earlier times, the cave forest when it was occupied periodically by Batwa as a council chamber and a retreat after raiding their neighbors. Mgahinga’s most exciting and memorable activity is tracking the mountain gorilla in thick jungle. The park has one habituated gorilla group (Nyakagyezi) which is visited by tourists. This consists of 11 members; 2 silverbacks, 3 adult females, 4 juveniles and 2 infants. This group is now settled in Mgahinga and nolonger crosses into Rwanda and DRC. Registration and briefing for gorilla tracking commences at Ntebeko at 07.45. Tracking starts at 08.30 and can take three to eight hours.